Lucy A. Snyder was winner of the 2009 Bram Stoker Award: Superior Achievement in Poetry. 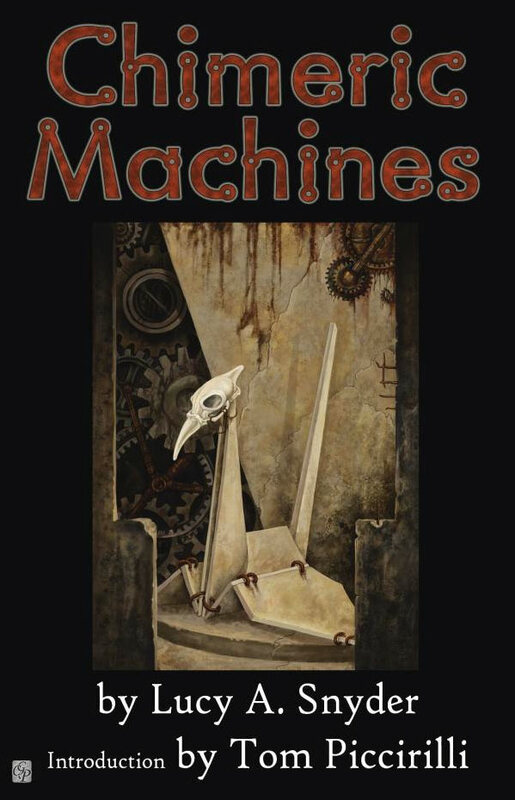 Chimeric Machines is, simply, a delight. Fifteen of the thirty-eight included poems had been previously published, over nine years, in various pro and semi-pro markets, including Strange Horizons, Chiaroscuro, Lady Churchill's Rosebud Wristlet, and Greatest Uncommon Denominator Magazine. I should say up front that Lucy is one of a handful of my favorite poets—her creations tend to tweak me just so: elegant, grounded, visceral, playful, knowledgeable, erudite, educated...she knows a lot about a lot, including the feel of language, and puts it all to good use. Tom Piccirilli's introduction is short, quirky, and a great way to set the mood before you dive in. Consider it a palate cleanser for the ever-fresh sashimi Lucy slices the world into. The book is broken into seven courses: Technica, Quiet Places, Dark Dreams, Crete Kentucky, Daughters of Typhon, Strange Corners, and Unshelled Evolution. Some sections are more coherent than others, but, for me, the first was the strongest punch. I made notes on each poem as I went, and so many of them, first time through, were just, "Yes. Oh Yes. ", or "Delightful", or "*hee*". That's where she hits me. The leading piece, "Modernism", is simple, but oh-so-elegant, beautifully wry, and hits on several levels. It's two brief stanzas, both relating the same scene, speaking on classical art and modern art, life, perspective, and it is...delightfully wrong, which is a mode I think Lucy aims for frequently. "And There in the Machine, Virginia Finally Stood Up" is a prose poem, and not what you might expect from the collection's title, but perhaps all the more powerful for that. Three pages long, a lifetime, but I wouldn't do the themes justice by explaining them. The poem does them justice, in spades. My only qualm is that the end is perhaps a bit simple, and glib, in comparison. But there is a lot of glib, throughout, and it's something she does very well. "Subtlety", which GUD originally published in Issue 2, gets a special call-out in the introduction, and it's well-deserved. From my slush notes, "I was hooked from the first stanza. The third one had me laugh out loud, for real." It still makes me giggle with glee, the punnery, and imagery, and sheer playful twisting of language, which is both subtle and so-very-not. "Sympathy" had me at "the soylent flesh of every blessed enemy", which, admittedly, was the last line, but I then wrapped around and enjoyed it anew--not because of any particular twist that reshaped the poem as a whole, but because I knew what was coming. And so on. Some other favorites, in order of presentation, were "glowfish", "Mute Birth", "Home for the Holidays", "Internal Combustion", "Infinite Loop: Girl with Black Eye", "Uncanny Valley Girl", "Book Smarts", "Dumb", "Permian Basin Blues", and "Photograph of a Lady, Circa 1890". I could probably list most of the book. Not everything worked so perfectly for me; in particular, I didn't enjoy the story-in-five-poems section, "Crete, Kentucky", but I expect folks other than me would enjoy it more. These poems were less playful, more focused on telling the story; there's still some poetry there, but I don't think it's up to the rest of the collection. And, overall, where I have a complaint, I think it's rooted largely the same—most of her poetry is so strong, that when it's not doing it's thing 110%, it falls a little flat, for me. Sometimes the poem is just too on-the-nose, or saying something I've read too many times without her characteristic energy; in one case she uses a gimmick twice ("Infinite Loop: Girl with Black Eye" and "Looped"; and "Infinite Loop: Girl with Black Eye" just does it much better than the other, I think); and another she hits a theme twice, and again, not so much as extends it, but does it better in one than in the other ("Ocean" vs. "Photograph of a Lady, Circa 1890"). My complaints are few and far between, and I mostly mention them so as to not over-sell you on some mythical collection that no one would ever find fault with. This is a brilliant collection. If you enjoy poetry, speculative fiction, language, life, or any combination thereof, you should really check it out. GUD has previously reviewed Lucy Snyder's "Sparks and Shadows" and "Installing Linux on a Dead Badger". You can read teasers of "Subtlety" from GUD Issue 2 and "Internal Combustion" from GUD Issue 5. The review book was donated to our reviewer, who insists on keeping it.